Current Prime Minister Theresa May is still seen as hot favourite to win the General Election on 8th June 2017. Are you betting on Theresa May to win the GE2017? Get a superb 4/1 enhancement on Theresa May to remain as UK Prime Minister at Betfair. Risk-free! According to the latest polls Theresa May has 88% of chances to remain as PM. The odds, of course, are quickly shortening but you can get MASSIVE 4/1 on Theresa May to remain as UK Prime Minister at Betfair, which is surely going to be one of the most exotic bets in the upcoming days. 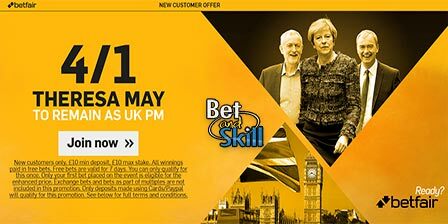 Place your first bet (max £/€10) on Theresa May to remain as Prime Minister after the UK General Election by taking the normal price on Betfair site. If your bet is a loser, Betfair will refund your stake. Risk-free! 1 Can I take part? • Deposit a minimum of £10 via Credit/Debit Card or Paypal. • Place a bet on 'Theresa May to remain as UK PM after the Election' in the 'New Customer' market at the enhanced price. • Winning Example: Enhanced 10/1 x max £10 = £100 paid in FREE BETS plus £10 qualifying stake returned as CASH. Applicable to accounts registered in UK, Ireland, Spain and Denmark only. For every 5 x £10 single bets you will receive a £20 free bet. More than £10 or more can be staked but will only count as one bet. Max bonus a qualifying customer can receive is £100 in free bets. "Betfair offer 4/1 Theresa May to remain as UK Prime Minister (GE2017 betting offer)"